The gallery is very delighted to announce a solo exhibition of works by Gerard Mullin. This is the artist's first solo exhibition and will include five paintings on wood, carved in an all-over geometric relief. 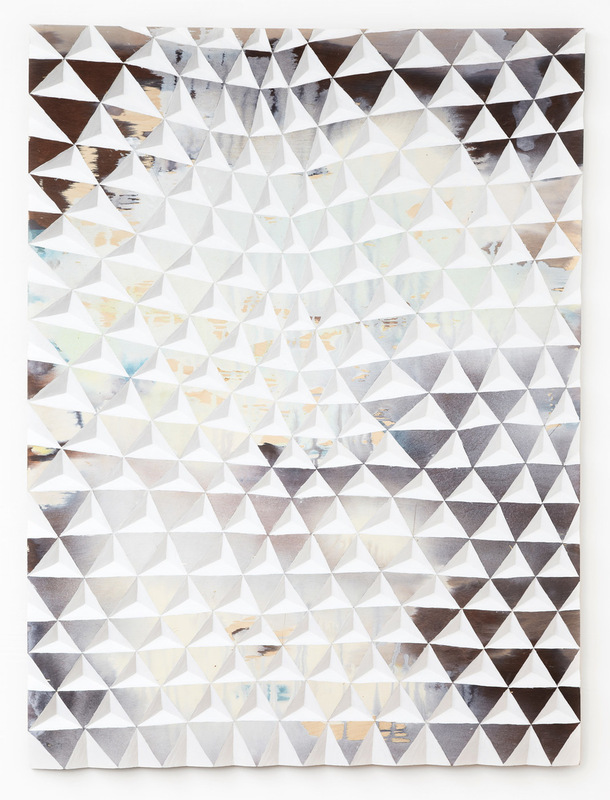 Mullin begins each work by laying a sheet of plywood horizontally and painting it edge-to-edge with a combination of watercolor, wood dye, and acrylic. He then chisels a specific shape into one edge of the wood in a row, and repeats this same pattern row by row. Bands of shapes bend and wobble from manual repetition and oscillate between flat image and dimensional object. When speaking of historical influences, Mullin mentions practitioners such as the Italian designer Osvaldo Borsani, British artists Ben Nicholson and Mary Martin, and the California architect John Lautner, each of whom explored the manipulation and folding of space and site. He is also interested in the philosopher John Rajchman, who in Constructions, theorizes that abstraction functions "...through informal diagram...by releasing other spaces, mapping other territories...densifying instead of rarifying, complexifying rather than reducing." Gerard Mullin (b. 1982, Derry, Northern Ireland) lives and works in Brooklyn, NY. He received an MA from the Royal College of Art, London, in 2008, and a BA from Goldsmiths College, London, in 2005. From 2009-10 he was an Artist in Residence at Leitrim Sculpture Centre in Leitrim, Ireland. Group exhibitions include "Geometric Cabinet," Kristen Lorello, NY, 2016, and "Everything Must Go," Casey Kaplan Gallery, NY, 2011.